Fifty animals are lining up in a single long line to take a ride on the whale. Everybody knows how long and slow lines are... The moles falls asleep, the flying squirrel can't be still, armadillo and porcupine have to endure skunk's smell, the lion gets hungry, what makes the zebra really worried, some play word chain. And finally is their turn! The adventure is so amazing that everybody wants to get back in the line! The plot is very simple, but kids love to see all the different animals in the line. After reading this book to them once, they actually would rather to "read" it to themselves. Sammy is a squirrel and considers himself a pirate. He "sails" the forest looking for pirate affairs. And one day it finally happens, Sammy finds a treasure map! The X marks the spot where hundreds of nuts are. Sammy is ready to go! A trip full of dangers and adventures is waiting for him ahead, but Sammy triumphantly goes through them all having always in mind the hundreds of nuts in the spot marked with the X. What at disappointment when he finally reaches the spot and not even one nut is there! Sammy is so mad he kicks a tree as hard as he can. Thousand of nuts fall from the trees! Trees that grew from the hundreds of nuts some pirates buried in the spot marked with an X! Sammy is incredible funny and lovely, the story is hilarious, the rhymed text is really enjoyable, and the illustrations are perfect for the tale. 5 Stars for this great book! Expected publication date: January 1st, 2016! Nobody understands what's going on. The frogs are confused. The rest of the animals think it's hilarious. Is the pig making fun of the frogs? Why would a pig want to be a frog? But the pig only wants to make new friends, even if that means to ribbit in the pond like a frog or tweet on a branch like a bird. We really enjoyed this story, that is funny and thoughtful at the same time.The pig looks cute and ridiculous in the pond. But this doesn't prevent you to feel he is doing his best effort to connect with the frogs. And when the only thing the frogs do is get suspicious, he just moves forward to the birds. He is stubborn and optimistic in equal parts. He is such a great character! The illustrations are awesome and add so much to the story. Are you sleeping little one? One by one each baby animal goes to sleep. You can pry how and where each of them sleeps. The baby giraffe stands still; baby fish sleeps swimming with its eyes open; the little bat hangs upside down; the flamingo balance on one leg. The text is rhymed and very sweet. The illustrations are cute and transmit a sense of calm. A perfect bedtime story. Sam is in ninth grade and has Down Syndrome. Writing and drawing in her journal helps her think and make sense of what looks messy at the beginning. In this third book in the series Sam's family is having a short vacation during the Memorial Day long weekend in a rented house near a retired military base. There they gather with other relatives, including Madison, Sam's teenage cousin whose father was injured while serving in Afghanistan and is still being treated in a hospital. It's a difficult time for Madison and she is not coping really well. It's really hard to get along with her. At some point Sam sees Madison doing something really bad, and she struggles about the best way of handle the situation to make things right without hurting anybody's feelings. Sam is a sweet girl, and the story is focused in her strength and skills, and not in her differences. I think the approach is fantastic. Any kid of her age can relate with her. I suggest you take a minute to stop by at Sam's top secret journal and Raise expectations facebook pages. I received this copy from the author via Bostick Communications in exchange for an honest review. I dream of an elephant is written in a smart rhymed way. In each page the reader dreams of an elephant of different color, and the last word of the paragraph, that is always the color, is missing. Since the text seems singed it easily induces the kids to shout the last word. It's a very interactive book, and this is definitively the best thing about it. Elephants of eleven different colors are portrayed. The pictures are very simple and, of course, very colorful. Excellent choice for toddlers. Lately Spoon has been thinking how his friends can do amazing things., while there's nothing special in what he does. Knife gets to cut. That's awesome. And Fork knows how to tame spaghetti. That's really skillful. And Chopsticks are so exotic! But Knife, Fork and Chopsticks also think Spoon is very cool. And along the book Spoon will find out all the wonderful things that make him so special. Diving headfirst in a bowl of ice cream! Come on! That's hard to beat! Very funny story with a beautiful message about valuing ourselves. Feathers is designed like a scrapbook, and it counts with wonderful illustrations. The text is concrete and easy of understand. Its goal is to show all the different uses feathers have for different birds. Each use of a feather is compared with common objects well known by kids and that have this same use for us: feathers are warm as a blanket, protect the skin like sunscreen, soak water like a sponge, or attract attention like jewellery. These are only a few of the "jobs" feathers have. You will be surprised! Age range: 4 to 8 years old. Beaver, Bear and Moose are really good friends, but sometimes they can be a little competitive. That's what happened that day they decided to climb the mountain together. Things went well while they friendly enjoyed the walk, but it turned less pleasant, and even dangerous when they agreed on turning the trip into a race. Moose got into trouble, and his friends had to decide between helping him or winning the race. Thankfully they are better friends than rivals. The race is over. Once at the top of the mountain, Beaver, Bear and Moose felt happy they decided to slow down and take the time to explore, discover and enjoy each other. Three lovely characters in a funny story about friendship and its vicissitudes, with a happy ending. I'd love to read more Beaver, Bear and Moose adventures! This book is wonderful! Mr. Postmouse loads up his wagon and his rounds begin. There's not too much text, but all the magic is in the illustrations, beautiful and full of details (and jokes) to discover. 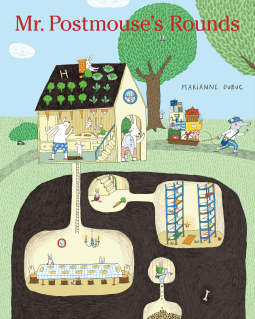 Each page is an amazing opportunity to take a look at the inside of different type of homes, burrows, some under the ground, on trees, or underwater, on the top of the hill, inside the hive and the anthill, and many more. Dubuc is certainly a skillful illustrator. It's evident in each picture all the care and thought that was put there. All and every page is worth a good few minutes to enjoy, look, laugh, comment and touch it. It's not a book to read alone, but to share. I highly recommend you to follow Mr. Postmouse in his rounds! Detective Gordon: The first case. Many nuts have been stolen from Vladimir, the squirrel, and Detective and Police Chief Gordon has to solve the case. In the process, which includes a lot of thinking, stamping and cake eating, he meets Buffy, a young mouse who becomes his assistant and friend. While Buffy wishes for many exciting cases to solve, Gordon, as the old and wise toad he is, wishes for a quite district with no crime at all. No crime. No punishment. The first case is a cozy mystery for kids, with adorable characters and many beautiful teachings in it. The illustrations are absolutely cute. I would love to read more Detective Gordon adventures. Leah, Belle and Raff know when they turn 14 years old they must leave the foster homes were they have been raised, and go through the magic portals that will transport them to a new and unknown world, as the law stipulates. In this new place they meet each other building a strong friendship. While exploring the gifts the new life brought to them, these three friends will discover they are part of an ancient prophecy, and for that reason they are in great danger. The only way of fight those conspiring against them is to finally put together the parts of the Amulet, parts that have been looking for them even before crossing the portals. The characters are lovable, and the plot, full of adventure and emotions, engaged me from the beginning. Looking forward to the next book in the series! Lovely pictures tell the story of a little clown who falls off the circus train and is found by a farmer. At the beginning the little clown is the one trying to cheer up the farmer. After all he is a clown, isn't he? But when his face is washed out he starts feeling sad. Now is the farmer's turn to cheer the clown up, and this will transform his life. A beautiful friendship has born. But the day arrives when the circus train comes back looking for the lost little clown. Then the farmer is left lonely again. Or is he? We have enjoyed in the past other beautiful books illustrated by Marla Frazee, like Mem Fox's Harriet, you'll drive wild!, and Mary Ann Hoberman's The seven silly eaters. She is such a talented illustrator!